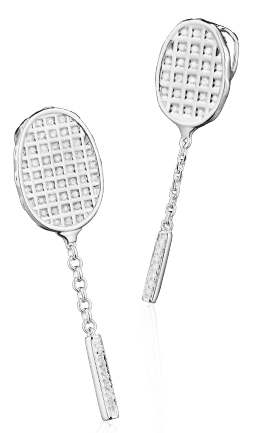 The Badminton All-Star Racquet Pendant is an all-diamond 925 silver badminton racquet. The pendant comes in two sizes: small and regular (see necklace size and diamond pieces below for specific information). Both the racquet handle and head are set with a number of diamonds (31 diamonds in the small pendant and 57 diamonds in the large). The badminton racquet neck is a 925 silver chain, which gives the pendant a nice free-flowing movement.